“Can I get a copy of the presentation?” It’s a ubiquitous question that pops up in the audience after you’re done with your slides and acknowledged the applause. “Sure,” you say and, most likely, pass the sources to event organizers taking a load off your shoulders. The thing is: few will get back to your slides. Even that hairsplitter who wanted to check if the figures added up in your charts may not bother after all. It’s not that you did a bad job – you actually did great! Turns out people just don’t feel like revisiting info sources due to mere technical complications. Professional presenters, salespeople, developers, designers, teachers, event spokespersons – we all have the problem of sharing PPT slides with a wider audience. Live presentations are cool, but they impose evident limitations. Those 10 – 100 listeners in the room will definitely enjoy the good vibes and a proper joke that come in a package with a nice presentation. Yet there are thousands of people out there who didn’t attend your class or event, but could make good use of your findings. There’s a bunch of web-based slide hosting services out there that can help you upload and share a presentation without quality losses or security implications. For example, iSpring Cloud is a slide hosting service that provides secure storage and sharing, plus more features like tracking. The good news is, this scenario makes a remote presentation easy, since it’s browser-based and there’s no need to employ your own proprietary server or deal with bandwidth issues. What’s more, most hosting providers include administrative tools so you can keep track of your presentations if you have only a few uploaded. On the downside, some services do make your presentation look different from the original PowerPoint. You can’t really expect the service to emulate all the effects, so you’d want to get familiar with the limitations beforehand. That said, technology is actually improving rapidly, and vendors like iSpring are offering seamless conversion with no compromise in output quality. Simply put, all animations and effects remain intact. Here’s another nifty option that helps reach a wider audience. Convert your presentation to video and place it on YouTube to start gathering coveted views, likes and comments. Just pick your custom converter and get started. River, Movavi, Wondershare … – you are free to choose. Most solutions act as add-ins to your PowerPoint, creating a separate tab or command on the menu. All you have to do is click “Publish,” and your video is right on YouTube without a hitch. As a rule, you can manage video quality and resolution before publishing. After the file has been uploaded, you can share the video all you want just by dropping a link on various sites. Use Facebook, Twitter, LinkedIn or any other social network and receive views, comments, likes, and shares. Since YouTube is on every Internet-enabled gadget these days, you are likely to get the most out of your message by uploading it there. Use cases in this scenario are innumerable, yet it seems particularly good for explainer videos. It’s a great example in which video definitely beats slides. Video presentations and tutorials run smoothly, with no need to click for a next slide or a pop-up. Feel like using more flexible formats? Then it’s worth trying HTML5. You could try to google for a free online converter, but beware: the quality is less than mediocre. iSpring offers an excellent converter that comes in a free version with some extras – iSpring Free. The paid version, iSpring Converter Pro, can also transform your PowerPoint presentation into a HMTL5 file, a format that helps you create cross-platform copy of your project ready for viewing on descktop and mobile devices. In any case, once you get your slides converted, feel free to upload the file to a hosting service of choice or embed the outcome on any website. Once converted to HTML5, your presentation gets all benefits described in point #1 above. Those in the educational sphere may opt for an Learning Management System (LMS). An LMS is basically a service for administration and delivery of education courses, online classes or training programs. Most LMSs include features for online collaboration to encourage regular feedback and knowledge transfer. Aside from slide demonstration, all LMSs collect statistics of viewer’s activity, such as passing tests or resolving certain tasks, as befits the educational process. As a rule, you need an account or contact details to access an LMS, thus your session remains personalized and secure. Some enterprises have jumped on the same bandwagon, using LMS’s for employee training and registration. Before uploading your presentation into an LMS, you need to convert the source file into an LMS-friendly format like SCORM. Check out iSpring Learn LMS, BlackBoard or Moodle to get a better feeling of how it works. 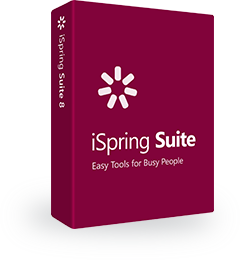 iSpring, for instance, provides corporate training platform with a powerful authoring tool and cloud LMS. Least sophisticated therefore highly popular, this method has its pros and cons. Indeed, you might be well off uploading your presentation on DropBox or Google Drive and sharing a link with a buddy. However, your buddies might not have PowerPoint installed. Or, chances are, they are using an older version, so turns out the slides just won’t open, and the visual frills you sweated over three nights in a row will get lost. Also make sure you always indicate file size, as a download may result in a very lengthy process for some people. Besides, there are security risks to consider. The presentation might get copied, modified and distributed across the web before you even know it. If your content is sensitive and better kept from prying eyes, it makes sense to consider safer options described above. Here’s our Top 5 ways on sharing PowerPoint presentations online. Hopefully, we managed to convey the feeling of how cool it is to broadcast your materials to a bigger audience yet stay in control of things. Whatever option you choose, make sure you get the most out of PowerPoint, which is a tremendously powerful tool, indeed. Good luck with your presentations, and stay tuned for more tech notes!